Did you watch the second series of the Great British Sewing Bee? Most of my crafty UK friends watched it avidly, including my friend Rachael. One of the contestants, Linda, is the mother of Sarah from Crafts from the Cwtch, who recently hosted the Miss Winkle KAL that I joined in with. 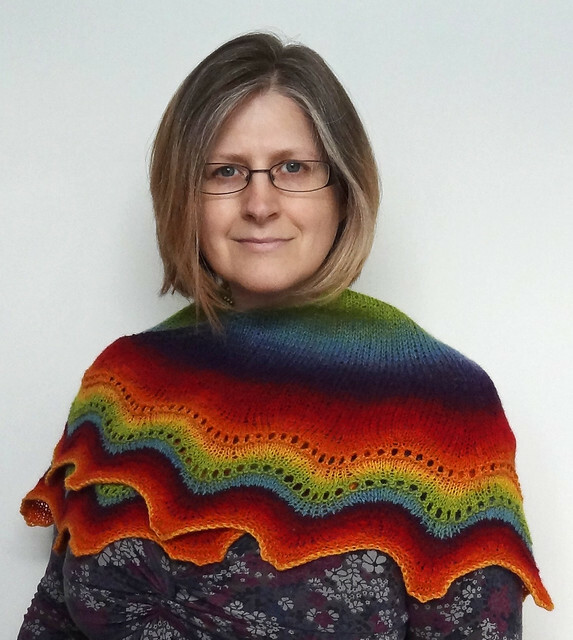 Last year Sarah made the Whippoorwill Shawl during her Summer KAL. I didn't join in last year but I LOVED the shawl that Sarah made. On one of the episodes of the Great British Sewing Bee, Linda wore that self-same shawl. 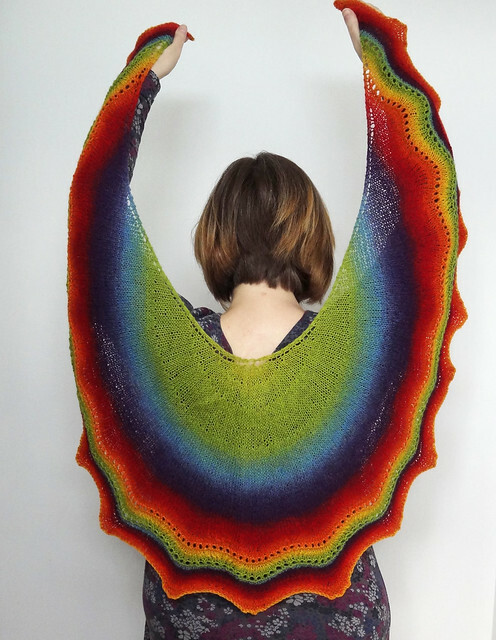 Unsurprisingly, I got a text from Rachael asking me about the shawl Linda was wearing. She wanted to know if it was hand knit. I replied that not only was it hand knit, but I knew exactly what the pattern was, and which yarn was used. I also stated that if she wanted the shawl for her birthday, all she had to do was ask. She asked! 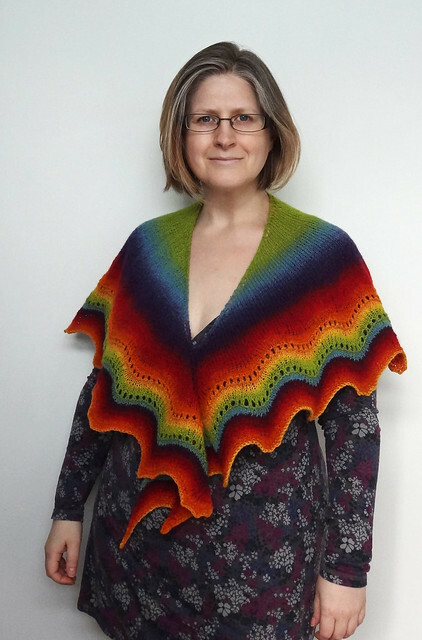 I was delighted as I had always wanted to knit this shawl using the same yarn, after seeing Sarah's. The yarn used is Kauni Effektgarn in the EQ colourway. I got mine from Scandinavian Knitting Designs. The skein was 600m and the weight of the yarn is more like a sport weight than a sock weight, which is what the pattern is written for. As my gauge is usually quite loose I used the same needle size recommended in the pattern for using with thinner yarn. 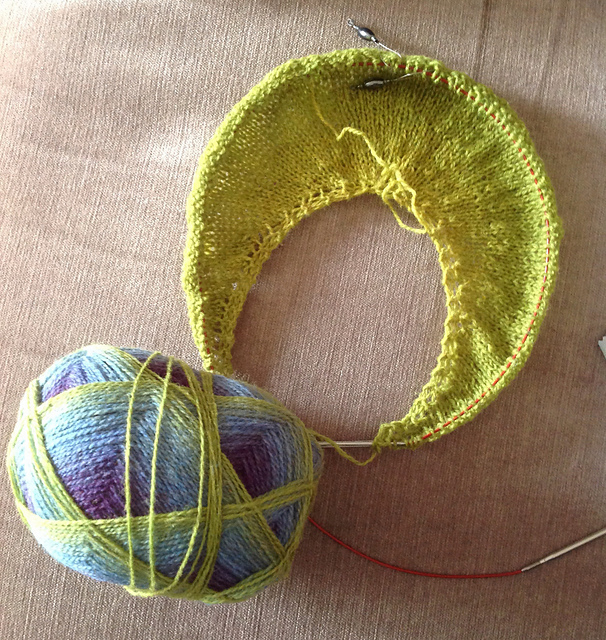 I was really pleased that the skein started with the lime green so that I could easily start with the colour, nearest the face, that suited Rachael's colouring the best. I decided to the do the medium size as I knew the thicker yarn would make it bigger than the pattern stated, and started work. 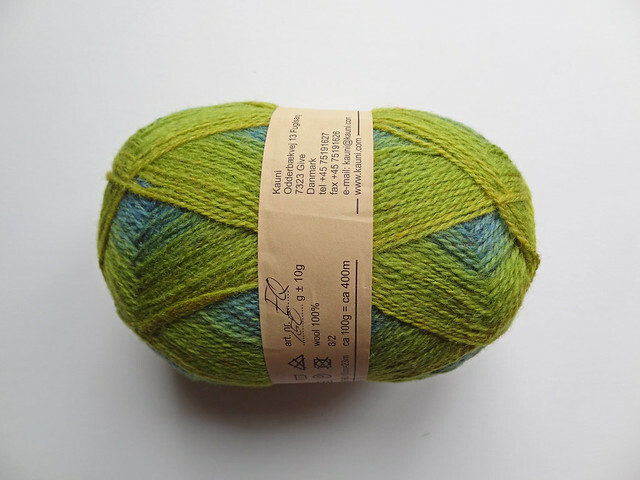 Kauni Effektgarn is a very "woolly" wool. It feels quite abrasive as you knit it, but it softens as you work it and blooms beautifully when blocked. It softens each time you wear it, but is rough and tough enough to last for years. One of my oldest shawls is knit in this yarn and it still looks the same as the day it was knit, in 2010. One thing about this skein that really disappointed me, was the abrupt break in the yarn. It was knotted together with a very obvious colour change. 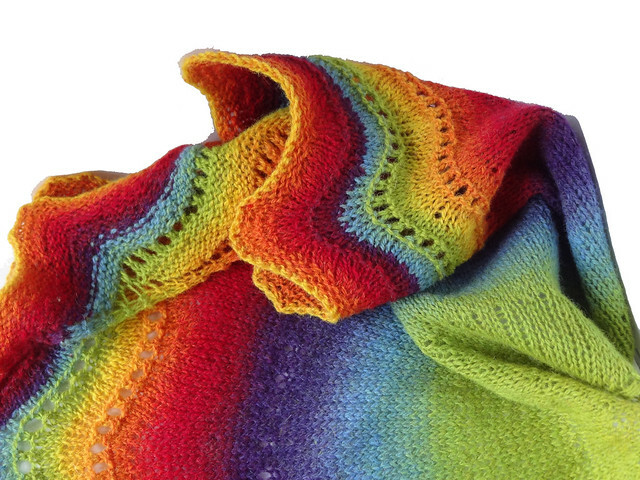 The beauty of this yarn is the smooth and gradual transitions of colour. 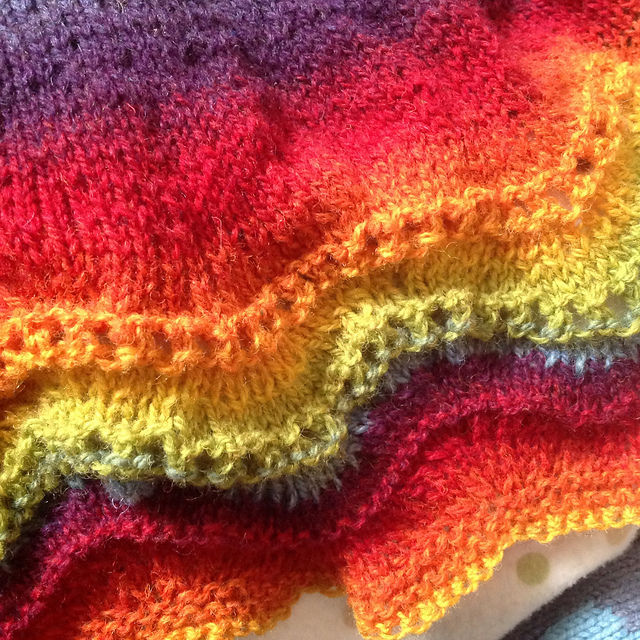 Luckily the colour change occurred towards the edge of the shawl where the colour changes are much closer together. It still annoys me though, especially as the shawl was a gift. You can see the change in this photo. It's between the last row of eyelets and the garter ridge below it. I'm pretty sure no one else will see it, but I know it's there! When making the ripples I used M1R in the first half of the ripple and M1L in the second half. For M1R I knit into the second stitch below the one just knit. For M1L I knit into the stitch below the stitch about to be knit, the one still on the left hand needle. This technique of making stitches is well hidden and leaves no holes. I didn't do the last row of eyelets in the pattern as they were very close to the cast off edge. I had read in some project notes that the edges curled quite a lot when done this way, so instead I did a few rows of garter stitch before casting off using Jeny's Surprisingly Stretchy Bind Off, my favourite way of casting off the long edges of shawls. I love the shape of this shawl. It makes it much easier to wear wrapped around the body, even without a shawl pin. Another great thing about using woolly wool, it is much stickier than merino silk blends, so shawl pins are less essential! When I blocked it, I used very flexible wires along the top edge to keep it as smooth as possible and then I pinned out the scallops on the bottom edge, using three pins in each "point" to keep the scallops as rounded as possible. I love this shawl. I am so glad I was prompted to make it. I really was tempted to make another one for myself but after seeing Rachael in it, I knew it would never look as good on me as it did on her. It suited her perfectly. When she tried it on she was delighted and I knew I'd finally got this shawl out of my system and didn't need to make another one, though I might be tempted to try it in a different type of yarn, maybe a merino silk blend this time! I do love it when I can make something fun and find a perfect home for it rather than it getting lost in my pile of shawls. Aside from talking about this latest make, I'd also like to take this opportunity to thank everyone for all the birthday wishes I've received this week. It really made me smile. Remember that there is still plenty of time to enter the Countess Ablaze Giveaway, you have until 16th May 2014, go and check out the end of this post to see what you could win.